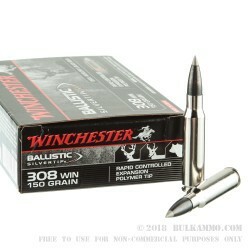 Winchester Silvertip .308 ammo is a power house in the hunting world. Using the Ballistic Silvertip technology to maximize the .308 caliber round, Winchester is truly offering a game changing cartridge. 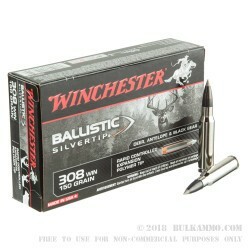 The Winchester Ballistic Silvertip bullets have a silver (grey) polymer point that is inserted during the manufacturing process. This “tip” causes the copper jacket to peel back as it strikes its target. As the polymer point pushes deeper into the lead core, the hollow point bullet opens, causing a "mushroom" or “blossoming” effect that creates a massive wound channel as it passes through the target. The Silvertip bullets also feature a black oxide coating known as: Lubalox. 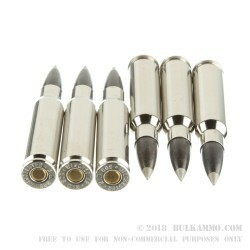 This is the same coating that was made infamous by the super popular Black Talon rounds. The coating is, of course, still used today and helps to reduce wear in the chamber and barrel, and to decrease fouling within the firearm. 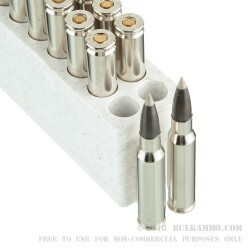 These 150 grain Silver Tip Hollow Point (STHP) bullets are loaded into Winchesters reloadable, thick-walled, non-corrosive Boxer primed, new nickel-plated brass cases. They have a muzzle velocity of 2810 feet per second and a heavy duty, hard hitting 2629-foot pounds of muzzle energy. That type of power is suitable for hunting medium to large game such as deer, black bears, longhorn sheep, etc. These cartridges come ready to shoot in their signature Black Boxes, loaded with 20 rounds of Winchester Supreme high quality .308 Win ammo. Get yours now and take your family out hunting or target shooting. If you are buying your ammo because it looks cool then this is the ammo for you! But the badassness is only cosmetic. i bought 6 different brands of 150 grain hunting bullets.